There is nothing more romantic than wearing a reminder of someone you love close to your heart. For centuries, the locket—a pendant that opens up to reveal a small space to insert a portrait, lock of hair, or tiny love letter—has been a lady’s favorite accessory to do just that. Queen Elizabeth I of England wore her locket ring daily; it contained a painted portrait of her mother, Anne Boleyn, and herself. She often gifted those in her inner circle with a jeweled locket containing her portrait. The Elizabethans were enamored with lockets, and the artists who painted the miniature portraits contained within them were the best artists of their time. The portraits for the lockets, as well as the lockets themselves, were only for the very wealthy as they were costly. 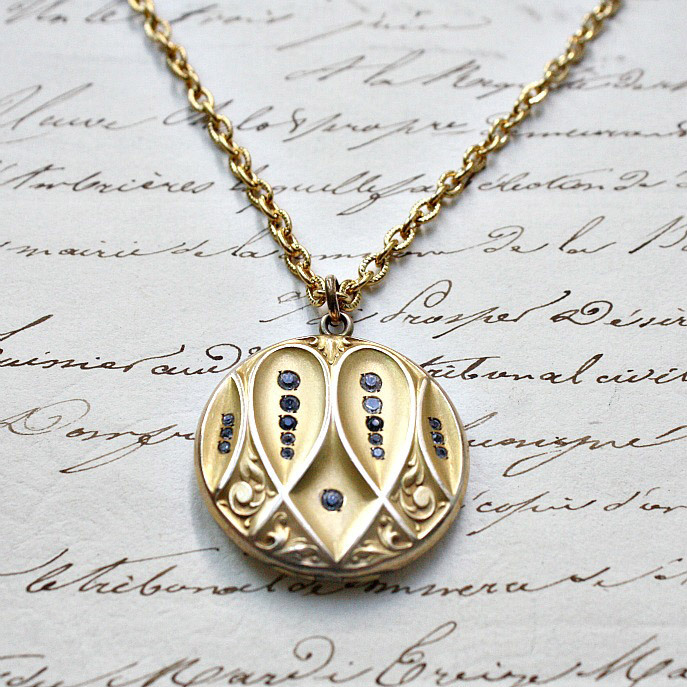 Lockets became a “must-have” fashion accessory during the Victorian era. Prince Albert gifted his beloved Victoria with a bracelet that had eight lockets, filled with a lock of hair from each of their eight children. Victorian ladies wore lockets on chains or velvet ribbons. Once Albert died, Queen Victoria wore a mourning locket with a photo of him inside every day, setting a fashion trend. 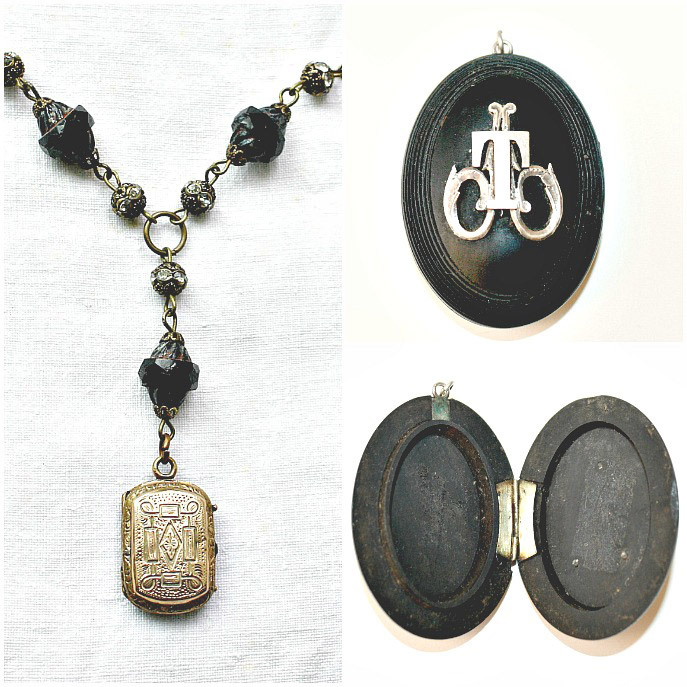 Mourning lockets were often made from black bog oak, like the one shown below with the sterling initials on the front. Lockets come in a variety of qualities: gold with diamonds and other precious stones, gold filled, gold tone, sterling silver, and silver tone. Some lockets have glass, some have celluloid covers, and some were made and sold without any covering for the photo spaces. Whether you are a collector or someone who loves antique jewelry, lockets are a wonderful and personal way to display your personal style. Highly collectable, expect to pay a few hundred dollars for gold filled or sterling lockets; real gold and diamond lockets will command thousands. I am always on the hunt for antique Victorian lockets and try to have a good selection available in my shop. Look for lockets in good condition. Check the hinges, the finish, and the interior compartments. Try to avoid lockets with deep scratches or damage. Buy only pieces you love, and you will have a sentimental, personal addition to your jewelry collection. Do you love antique jewelry? What do you treasure most? I was wondering if you could possibly help me with identifying what type of locket I have? I have a gold locket that is solid gold with 2 pictures of my grandmother and her parents. It has 4 diamonds, one is missing. No markings. My grandmother was born the late 1800’s. Thank you so much for the lovely read regarding the antique lockets! I cherish a beautiful gold, dainty locket that my grandmother gave me many years ago. Inside it has a sweet photo of my mother at age sixteen on one side and on the other side, a dapper photo of my grandfather at age thirty-five. “Mama” passed away in 1990 so this precious keepsake from 1940 is my most favorite piece of jewelry. Rita, what a serendipitous find! Lockets with four photo frames are a lot more rare to come by, I can see why you treasure it. My locket is not an antique but I do love it. I only wear Black Hills Gold and I was lucky enough to find a locket that holds four pictures. In it I carry pictures of my four grandchildren. I was so happy the day that I found it. I can carry my kids everywhere I go. Thanks for a great story. 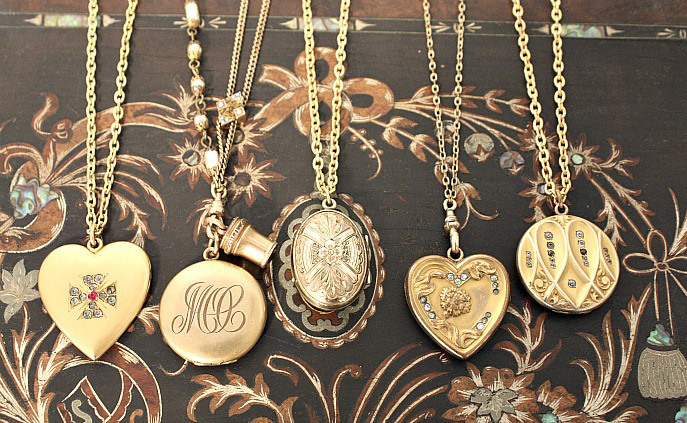 I love the old lockets. In the past I have frequented estate sales to find antique jewelry! Beautiful post Lidy! I really enjoyed reading it. Wonder if the lady who built my 1886 Victorian house, Mrs. Hobbs, wore a locket? I will be on the look out for one as we renovate for sure. Have found some treasures so far, but no locket yet. I love that you know the name of Mrs. Hobbs, who built your home Kelly! I’m sure she wore a locket, most Victorian ladies had one! That is the thing I love most about lockets, more than most pieces of jewelry they are given by someone special and hold great sentimental value. 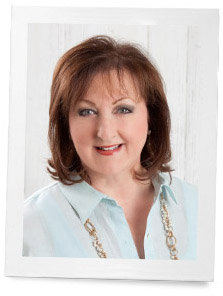 I am always so excited to write a guest post for you about antiques, Phyllis. Thank you for being as passionate about these pieces of history as I am! My Granddad Hill gave me a tiny gold locket when I was one. I love it so much. Thank you Lidy for your lovely post and wonderful photos!! I always love having you guest post here on Ribbon! and wear it for Christmas too. Thanks for the reminder. I am so fortunate to have been given a gold locket from the Victorian era for Christmas 1971. My Mom had the date engraved on the back where the initials of the original owner are. It is a beautiful round locket with grapes on it. It originally had marcasite in it however I had tiny diamonds put in when the Marcasite fell out. It is one of my most treasured possessions and realize I am only a temporary caretaker of it for its beauty will endure long after I am gone. It will be passed down to my niece when I am gone. My gold,engraved “heart locket” is my most cherished piece of jewelry. It was gifted to my Mother (born in 1929) from my Grandmother on her 12th birthday . My Mother passed it on to me on my 12th birthday . My vintage locket is priceless – worth more to me than any gemstone . I see the smiles of Mom and Grandmom each time I fasten the locket around my neck . There is no price for such a memory ! Driving home from a wonderful Thanksgiving in the mountains with all the family, I read your special blog!! I too, have a locket given me by my husband 40 some years ago when our two children were small. It has been too long in the drawer. I will bring it out again soon and wear it. Thanks for the wonderful holiday reminder. CJ, I love the idea of you perhaps wearing your special locket at holiday time! Sharing the story of the gift from your husband with your family makes it even more special. Susan, most jewelry stores should have an array of chains, gold, silver, or plated that may work. 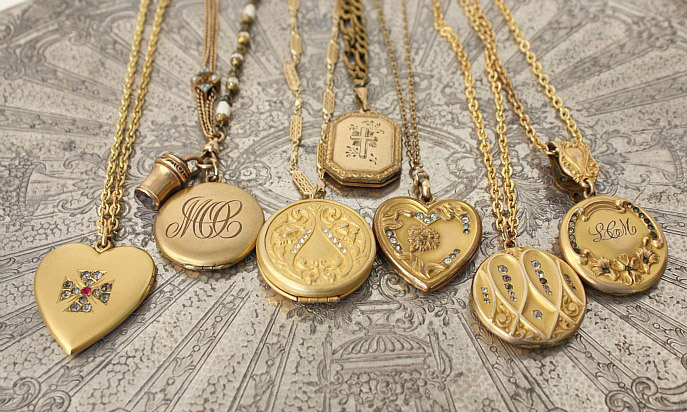 Make sure to take your locket with you so that you can see what looks good. If the locket won’t slide over the closure, the jeweler can remove the link and reattach once the locket is on the chain. Good luck! I have 3 lockets…each reflects a different time in my life. One is actually my grandmother’s and is most intricate with an accordion fold out like photo inside. It is very unique and of course, is of the highest sentimental value. A silver spoon pin – not a locket – is my treasured gift from my beautiful late Aunt Lula. She gave it to me when I turned sixteen, almost 60 years ago. Jo, your pin sounds lovely, and the fact that you received it from your Aunt Lula, precious beyond anything else. Isn’t it so sweet to have beautiful memories to those we love that we can wear and enjoy? of my two beautiful grandchildren; Helena and Henry. I’ll drop a hint to hubby. Thanks for the opening up an idea you made my day! Merry Christmas to all. I loved reading this page today. It reminds me to take out my great grandmother’s locket and wear it again. It has initials for Louise Toy Brasher on the front like the second locket from the left above. She always carried a picture of each of her daughters when they were very young women. Lovely. Claudia, how fortunate you are to have your grandmother’s locket! I hope you do wear it, either on a chain or on a velvet ribbon, choker style. Lovely article! I am a huge fan of antique jewelry, especially anything from or inspired by the Victorian Era. I would love to own a genuine Victorian locket some day. Very interesting reading indeed. Thank you Lidy for sharing this and enlightening us on these treasured pieces.